A really well run event all the way around, I had been looking for an opportunity to get DeAndre Hopkins autograph on a few cards. It can be quite a saga to get to Houston, but this one went off without a hitch. I met up with Lance and we caught up while waiting in line. Although the weather deteriorated after got I there, it worked to our benefit, as less people showed up, allowing us to go through the line a second time. 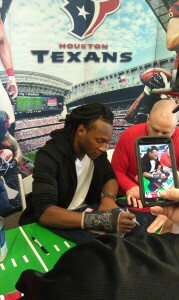 Hopkins had a cast on his hand. Unfortunately I asked why he had it and this translated into a usable news bite for the local media. Thankfully he was just having a minor procedure. DeAndre Hopkins was tagged very early on in the draft process by pundits going to the Texans in the 2013 draft. They’d be dead on, as DeAndre was selected by Houston with the 27th pick of the first round. Although I had my eye on a few other players at that position, I was satisfied overall with the pick. A prolific receiver for the Clemson Tigers of the ACC, DeAndre Hopkins set school records for career receiving yards (3,020) and touchdowns (27). He joined the Texans and contributed immediately to the starting lineup. He’d be one of the few bright spots on the team as Houston’s fortunes sunk to a 2-14 record. Hopkins showed flashes early in the preseason and it quickly translated to the regular season when he caught his first TD in an OT victory over the Titans. Hopkins earned All-Rookie honors finishing 2013 with 52 receptions for 802 yards and 2 touchdowns. As the team transitioned at quarterback from Matt Schaub to Ryan Fitzpatrick in 2014, Nuk’s numbers only improved, as he posted career highs with 76 receptions for 1,210 yards 6 touchdowns, including a 76 yard long. Hopkins always seems to save the best for Tennessee. During their 2014 home stand, Hopkins caught 9 passes for 238 yards and 2 touchdowns in a 45-21 thrashing of the Titans. I drafted him very late in my fantasy draft last year, and reaped the rewards. 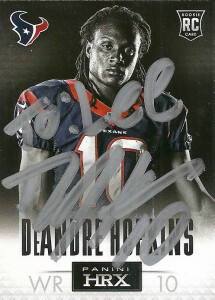 An ascending star on the Houston offense, Hopkins is the heir apparent to Andre Johnson in the Texans receiver corps.